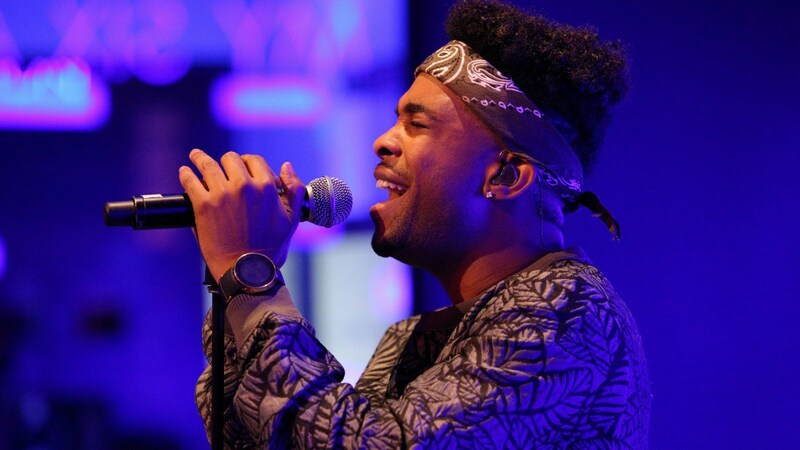 Tomorrow [June 23, 2015], the world will be formally introduced to the talented songwriter/singer Elijah Blake as he will release his proper debut retail album Shadows & Diamonds. The 23 year old artist got his start as as songwriter, writing tracks for Trey Songz, Justin Bieber, Rihanna, Keyshia Cole and others, but the tipping point for him was writing & winning a Grammy for Usher‘s hit #1 single ‘Climax’ in 2012. He released an impressive mixtape titled Bijoux 22 in December 2012 after inking a deal with Def Jam Records, and followed that up with his Drift EP, his first release under ARTium/Def Jam Records, in 2014. Now under the guidance of No ID, Elijah is ready to take the next step. Before we head into talking about ‘Shadows & Diamonds’, I wanted to know why you changed the album’s title from ‘Songs About Melody’ to ‘Shadows & Diamonds’. Man you did your research! I changed it from Songs About Melody because on the first half, some of the songs are about Melody, some not, ’cause you know the album was supposed to come out around a certain time & it didn’t, so we added some new songs that added to the project and I was in a new place. Shadows & Diamonds represents finding the light at the darkest times, or the darkest areas of your life and that’s what I was kind of confronted with. I went through a period where I was like “Why isn’t the album coming out? Man I feel like it’s ready, I’m ready” and you know, I just felt like I could of either just taken it and tightened it up or I could have taken a chance and kept moving – look at it like a little piece of hope, like a little glimmer in the corner and applying the pressure… & then turn it into gems. That’s what I felt like. I feel like the standard album you have 12 gems & on the deluxe have 14 [gems]. They are all true to me & what I’ve been through. Songs like ‘Everyday’, ‘Shadows & Diamonds’ were added to the album… & ‘I Just Wanna…’ was added to it – ’cause I didn’t have that song when [the album] was originally Songs About Melody. I was in a different place. I was really cerebral – I know on my mixtape & on my last EP I was super cerebral & emo and this time I was just confident in myself as a young man and was comfortable in my own skin being the guy that not necessarily the most hood guy on Earth… ’cause that’s not me (laughs). But you know just being comfortable with that. I look at a lot of my friends. Two of my best friends that I went to high school with are serving life sentences in prison. I have no choice but to be happy ’cause I could been right along with them – ’cause it is not like they pulled a gun and killed people, they were just in the wrong place at the wrong time. Damn that’s crazy I didn’t even know that! How does it feel to have your own solo record as a solo artist start to make those moves as opposed to a song that you wrote for somebody else? It feels like all that work I put in – songwriting for other people even at times I didn’t feel like it – it wasn’t in vain. That was the plan from the get-go. I never saw myself as a songwriter… I’m not going to knock it because at the end of the day it put food in my mouth, it helped pay my mom’s mortgage. The whole plan was for me to be here, telling my story, using my gift that God gave me to help change the world. I’m sure you have gotten this a lot since the ‘I Just Wanna…’ video came out, but I had no idea you could dance. At all. [Laughs] I don’t think anyone did! When I first got signed – because I went to performing arts school my whole life I was always dancing – I was dancing my whole life. I’d be in the studio with Ciara or Usher… & I know for a fact that Ciara was aware of my dancing ability and even Usher, me and him talked about it. He told me about the importance dancing had on his career. And in the beginning we were just like, I’m a little younger than Chris [Brown], so me & No ID were just kind of like, we don’t want this to be a distraction as a new artist coming up and seeing the first thing that would happen would be the Chris Brown comparisons. That’s coming from an honest place ’cause that was a true concern. I wanted it to be about my music and my message and my voice because at the end of the day when you remove the choreography and you remove all the lights, I’m going to sing & I’m with that from the heart. I’m confident in my vocal ability, but I didn’t want to neglect it. There were people like Usher who were like “You gotta dance.” So I got that from my peers. Oh yeah, I’ve definitely seen a little of that, but it is like people are so used to being cheated for their money. I paid for my own dance rehearsals out of my own pocket. Sometimes for shows it is so last minute I have to pay for the dancers out of my own pocket outside of the label trying to help when they can. I’m making good off my songwriting and I’m putting it back into myself, and its like I’d rather them be upset and let me be the artist that I want to be through my own due diligence and dancing to my art. Am I supposed to be hiding it & suppressing it just for the sake of preserving fans? Because they aren’t going to stay if they aren’t real. Before talking about No ID’s influence on you and the album, I wanted to find out if he is still making you write 10 songs a day. We did that at the beginning to just break the ice and we’re both super competitive & that’s what makes us really good. We were really just trying to figure it out. But no, we haven’t done it lately we’ve just been making the best music possible, but at the beginning we definitely did that. Was it kind of like your coach telling you have to stay after practice and get some shots up? It’s like “c’mon man, we already know I’m good”. [Laughs] Then you get to the playoffs, where it’s crunch time, and it’s like “oooh, I got this” because I put in those extra practice hours that nobody else was. Because now for the album I already knew how to approach a No ID beat like none other. I think it made us that much closer & now he’s like the Quincy Jones to my music. I know that’s a big word but that’s how I see him & I can’t really say it in any other context because I think he’s the last of the real A&R. How hands on was he [No ID] on ‘Shadows & Diamonds’? Oh super hands on. It was his baby. He protected it, ’cause as a new artist its tough man. Music is not selling how it used to be and the record labels can’t take risks so it takes a guy like No ID who is a staple in the music industry to be able to take those risks. Because now if you put something out and it doesn’t work – you throw something at the wall and it doesn’t stick – it is onto the next. So for somebody like No ID to really have his neck out for mine when he can easily send it out to Kanye [West] and Jay [Z], or Common, and taking chances on new artists like me, Jhene [Aiko], Vince [Staples], & Logic. So he was super hands on for the project and the first time I was going to release songs for free or put the great songs on the mixtape he would have to fight me and it would somewhat make me mad because I wanted the music to be out there. So that’s why we were able to have Shadows & Diamonds because there are a couple songs on there that I tried to give away for free out of frustration. I feel that’s what Shadows & Diamonds is. Like, if people loved the mixtape [Bjioux 22], the best songs that No ID refused to let me give away for free, those are on the album album [laughs]. What is your opinion on streaming services like Spotify from a songwriter’s perspective and from a solo artist’s perspective? I saw one of the most prolific songwriters of all time say one of the songs she wrote got played over three million times and only made $100 something dollars or something crazy like that. That’s gotta be changed but at the end of the day music is always changing and I think that it is up to the artists and the labels and the manufacturers to find a way to capitalize off that. I think the media keeps talking about these first week sales… It’s like talking about trying to save dinosaurs. They’re already extinct [laughs]! We’re so accustomed to first week sales that people in the ’90s & early 2000s were still doing. Like Usher sold a million first week off of Confessions, but even someone like that only sold hundred something thousand [128,000] of his last album. It’s not like he’s not the same singer or he’s not singing as good, its just the industry has changed so much and the artists are getting held accountable for things that are out of our control by the labels. Things are definitely switching over to streaming but we still gotta figure out how to capitalize off of it and add certain aspects to it so we’re able to make money and the survive while creating music… because it is a business at the end of the day. To wrap things up, just tell me the main thing you want people to get out of ‘Shadows & Diamonds’ both on an artistic and personal level. The main thing I want people to get with this project – I didn’t do an album full of hits or songs I would have written for other people like Trey [Songz], Rihanna, Justin Bieber… I could have easily done that but I wanted people to walk away with a sense of Elijah Blake‘s identity. I wanted to set the groundwork and foundation for my next 10 albums and not just come in as a singles based artist because that’s not a question. I don’t think that’s ever been a question in anybody’s mind or if it is, they’re just mistaken, because it’s not a question that I can write hits. That’s proven. But the question now is who am I as an artist – as an individual? And that’s why I don’t have a million features on my project because I want people to walk away from Shadows & Diamonds like “this is my homie” or “this is my future baby daddy” [laughs]. I just want them to get a sense of how my mind works and what my fears are, what my insecurities are, and what I am still working on as a man. It shows where my flaws are and where I feel like I lack in communication or where I over-communicate. I’m just honest and vulnerable and I think that was what R&B is about. R&B began with rhythm and blues, and right now we have a lot of rhythm but not a lot of blues and I wanted to bring the blues back to R&B.